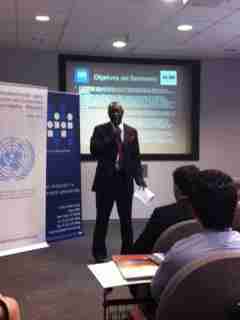 OSWIECIM, POLAND – Adama Dieng, Special Advisor to the UN Secretary-General on the Prevention of Genocide, delivered the keynote address in Auschwitz at the first training seminar for the Latin American Network for Genocide and Mass Atrocity Prevention . Sixteen of the 18 member states of the Network were represented by their Ministries of Foreign Affairs, Justice, Defense, Naval Academies, and Offices of the Ombudsman. Mr. Dieng and his office have continuously shown support for the Network in the form of financial and logistical contributions, as well as regularly serving as instructors in the Network’s training seminars and various national initiatives. Mr. Dieng consistently mentions the Latin American Network as an example to be followed worldwide in the field of genocide and mass atrocity prevention at the regional level. In his speech to the first Regional R2P Focal Points Meeting in Slovenia in April 2013, Dieng mentioned the Network as an example of the “strong steps forward” that are being taken around the world in genocide and mass atrocity prevention. The Latin American Network was launched in March 2012 in Buenos Aires, where governmental institutions from 18 Latin American states agreed to prioritize genocide and mass atrocity prevention throughout their region through various methods, including capacity building in both the governmental and non-governmental sectors, public policy development, and national and bi-lateral initiatives aimed at developing other tools for prevention in all areas of government and civil society. Click here to read the full text of Mr. Dieng’s speech.